Yama: The Yamas are the moral commandments or the Universal Ethic. 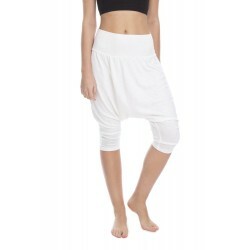 Stylish and multi-purpose fluid pants to compliment the other styles in our women’s section. Either for your yoga practice or for a casual street-look, Yama is perfect with its comfort and elegance to wear all day long. Available in ecru, black and stone grey.